Despite my earlier proclamation that John Wall was a lock for MVP, I’m now pivoting to LeBron James over James Harden, mostly for irrational stylistic reasons. It’s hard to choose an MVP this early in the season, but I would probably say LeBron James. His dominance and physical greatness this season should get him one more MVP, maybe. Besides him, I would put James Harden (for his individual stats) and Kyrie Irving (for leading Boston to best record). Right now, it’s probably LeBron James (apologies to James Harden). He is having a remarkable shooting season (64 percent on twos, 42 percent on threes, both career highs) while also delivering the rest of the usual goodies. If the Cavs don’t fall below the East’s two-seed, he will win his fifth MVP. James Harden would be running away with the MVP if it weren’t for LeBron James chasing him down in the past 11 games. Without The Beard, the Rockets would still be respectable in the West with all their firepower and Chris Paul. 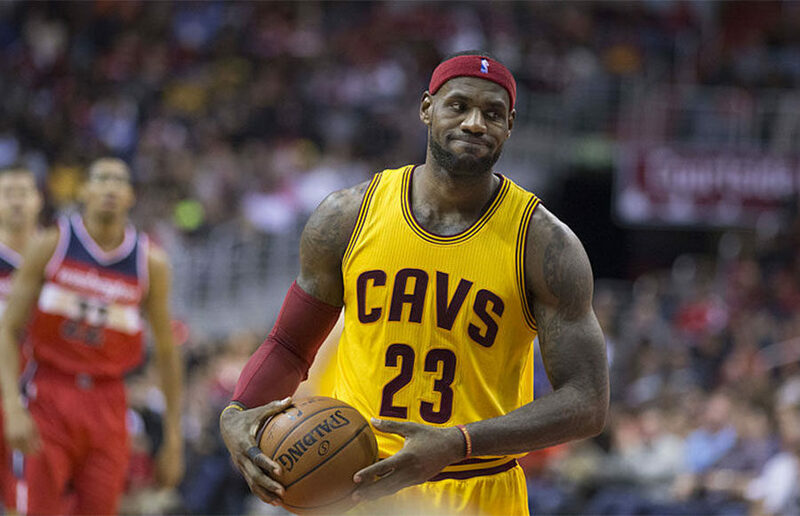 Without LeBron, the Cavaliers would be the dump of the East, thus giving a slight edge to Bron. AW: Ben Simmons is a lock for Rookie of the Year as long as he gets to 50 or so games — I thought he deserved to be the No. 1 pick, but wasn’t sure if he’d be a stud. He looks like he could be the best player of his generation. CS: I don’t think there is much to say. Ben Simmons. Lonzo Ball and Donovan Mitchell will probably be in the conversation, but that’s all. DN: Ben Simmons, without a doubt. If he ever develops a jumper, look out. LX: Have you heard of this kid named Benjamin David Simmons? AW: On the MIP front, as far as I’m concerned, Jaylen Brown is a shoo-in. CS: Victor Oladipo’s transformation to a star and a leader in Indiana is more than enough to earn him the MIP award. DV: Kristaps Porziņģis, who is flourishing in New York after the departure of Phil Jackson and Carmelo Anthony. His points per game are up from 18.1 to 25.8, and he is now shooting almost 40 percent from three. LX: It’s a toss-up between Kristaps Porziņģis and Victor Oladipo, but I’m going to go with the latter since he has been slightly more unexpected. Oladipo has shown the sustained excellence many expected out of the former No. 2 pick and with full reins in Indiana, it’s hard to say this is a fluke. What team has exceeded expectations so far? AW: The Celtics are better than I thought they would be even before Gordon Hayward got hurt. I’ve never been a Kyrie fan (and thought he may just be a step down from Isaiah Thomas) and with what seemed like a thin bench and last year’s troubles with rebounding, I just couldn’t imagine this team could be this good this quickly. Trust in great coaches, I guess. CS: The New York Knicks lead by Kristaps “The Unicorn” Porziņģis, for sure, have exceeded the expectations the most. They are walking around the .500 line and are in playoff contention even though the season is very young. It’s uncertain if they will be relevant at the end of the season but they sure look like a legitimate team right now. Frank Ntilikina’s and Enes Kanter’s encounters with LeBron James will probably be the best sight in MSG for a long while. I feel like that game against the Cavs, however, will summarize the Knicks’ season; a very exciting one on which you fail to capitalize at the end. But who knows — maybe they will exceed my updated expectation as well. DN: The Boston Celtics. It is absolutely absurd that they lost their star forward Gordon Hayward for the season in the first game and still are 21-4, with the league’s fourth-best net rating (+6.8). Kyrie Irving and Al Horford have developed fantastic chemistry, while the young wing pair of Jaylen Brown and Jayson Tatum is outperforming all preseason expectations. Also, how about the Indiana Pacers? This roster has no business being 13-11, but here we are. Credit guard Victor Oladipo, who also deserves some serious consideration for Most Improved Player. Fun stat: There are only four guards scoring more than 23 points per game on an effective field goal percentage of 55 percent or higher (James Harden, Steph Curry, Kyrie Irving and Victor Oladipo). LX: I had to rub my eyes a bit when I saw the number five in the assists column next to Andre Drummond’s name the other day… at the end of the first quarter. These Detroit Pistons have surprised everybody outside Motor City, considering their only offseason change was trading Marcus Morris for Avery Bradley. No reason why this should stop. What team has failed to meet expectations? AW: Come on, Hornets! I love Kemba Walker, thought Malik Monk was a steal and they’ve had an engaged Dwight Howard throughout the season. To me, there’s no excuse for them not to be a playoff team. Maybe former assistant coach Patrick Ewing was way more important than we thought. CS: I don’t think there is much discussion on this one. OKC has fallen from the West’s best bet to beat the Warriors to a team that might watch the playoffs at home. I still don’t think they will be “Now this is going to be fun” 2.0. With that collection of talent, they will make the playoffs, but Billy Donovan needs to figure things out fast. Sam Presti needs to keep being a genius and add some talent to the bench. I sincerely believe that veteran free agent Monta Ellis would be a good starting point. DN: Unless you were expecting an aging Mike Conley and Marc Gasol to lead a talent-poor Memphis roster to the playoffs (I wasn’t), the obvious answer is the Oklahoma City Thunder. Even though the team has the eighth-best net rating in the league, it is only 11-12. This is largely because of its elite defense, but Billy Donovan had better start getting his players to move on offense — otherwise, this team will struggle to win even one playoff series. Honorable mentions go to the Charlotte Hornets and the Washington Wizards, but both have dealt with significant injuries to their starters. LX: The easy answer is the O K L A H O M A C I T Y T H U N D E R, but realistically, it’d be hard to say one didn’t see it coming with three ball-dominant stars (Melo a fringe one) sharing one basketball. In the East, the Bucks have been incredibly mediocre despite all the hype around Giannis and his young, athletic and long-supporting cast. The whole is much less than the sum of the parts for these two playoff-worthy rosters. Who do you see in the playoffs? West: Golden State, Houston, San Antonio, Denver, Minnesota, Portland, Memphis, Oklahoma City. I think that the Thunder is what it is — Russell Westbrook and Paul George simply don’t mesh, and I think Carmelo Anthony is a bench-warmer at this point in his career. The Jazz are too thin to stick around, so I see Memphis getting healthy and making a final push. This team was fine before it had to deal with injuries. East: The Pistons will fall further down in seeding and the Wizards will rise, but I think the eight teams in right now are the eight teams that will be there in the end. West: Houston, Golden State, San Antonio, Denver, Minnesota, Portland, New Orleans, Oklahoma City. It will probably be a playoff dominated by the Northwest Division. I can even see all five teams making the playoffs, but probably only one would be able to pass the first round. The beginning of the season actually showed that the West is competitive but not as good as we were expecting so far. East: Boston, Cleveland, Toronto, Detroit, Washington, Milwaukee, Miami, New York. Indiana would probably be the ninth team in the race and the injuries will probably play a big role in who’s making the playoffs. But one thing is for sure: the East promises to entertain. West: Golden State, Houston, San Antonio, Minnesota, Oklahoma City, Denver, Portland, Utah. The West will be dominated by the usual suspects. The four through eight seeds should all be solid teams that will not go down easily, but the only one that has enough talent to beat one of the three elites is Oklahoma City, provided the team gets it together. East: Boston, Cleveland, Toronto, Washington, Milwaukee, Detroit, Miami, Philadelphia. The East is still Cleveland’s to lose at this point. Boston is playing well, but I have a hard time believing the team’s regular-season success will translate to playoff wins. Washington and Milwaukee should eventually creep back up in the standings to top four and five seeds, while Detroit and the feisty Sixers will make noise in the first and maybe second rounds. West: In no particular order — Rockets, Warriors, Spurs, Nuggets, T-Wolves, Blazers, Jazz. The Thunder would be the eighth team, knocking off the Pelicans. Don’t bet against the reigning MVP. East: Barring injury, the top seven in the East look just about right where they should be — Celtics, Cavs, Raptors, Pistons, Sixers, Bucks, Wizards. The eight seed goes to the Heat for me. Don’t bet against Dion Waiters. Contact Daily Cal Sports at [email protected]. The sports blog is a your home for all things Cal athletics. We give you the lowdown on players, scores, predictions and all other action-packed news.